36. Letter from Dumas to McCallum, Canning Dam, 1936. Of itself, this letter appears to be fairly inconsequential. 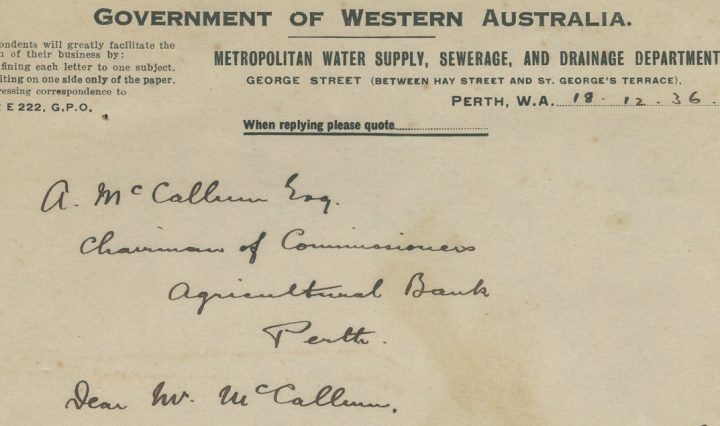 Written by Russell Dumas (later Sir Russell), to Alex McCallum, it connects two men who made significant contributions to the development of water resources for the expanding population of Perth and … Continue reading 36. Letter from Dumas to McCallum, Canning Dam, 1936.